Search is not just a box and ten blue links. Search is a journey: an exploration where what we encounter along the way changes what we seek. 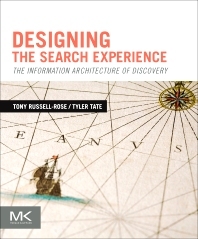 But in order to guide people along this journey, designers must understand both the art and science of search.In Designing the Search Experience, authors Tony Russell-Rose and Tyler Tate weave together the theories of information seeking with the practice of user interface design. Tony Russell-Rose is director of UXLabs, a UX research and design consultancy specializing in complex search and information access applications. Before founding UXLabs he was Manager of User Experience at Endeca and editor of the Endeca UI Design Pattern Library, an online resource dedicated to best practice in the design of search and discovery experiences. Prior to this he was technical lead at Reuters, specializing in advanced user interfaces for information access and search. And before Reuters he was R&D group manager at Canon Research Centre Europe, where he led a team developing next generation information access products and services. Earlier professional experience includes a Royal Academy of Engineering fellowship at HP Labs working on speech UIs for mobile devices, and a Short-term Research Fellowship at BT Labs working on intelligent agents for information retrieval. His academic qualifications include a PhD in human-computer interaction, an MSc in cognitive psychology and a first degree in engineering, majoring in human factors. He also holds the position of Honorary Visiting Fellow at the Centre for Interactive Systems Research, City University, London. He is currently vice-chair of the BCS Information Retrieval group and chair of the IEHF Human-Computer Interaction group. Tyler Tate is the co-founder and design lead of TwigKit, a London-based company that provides a library of user interface components for rapidly building search-based applications. At TwigKit he has helped numerous startups, corporations, and government organizations achieve superb search experiences. Prior to specializing in search Tyler ran a small design studio, taught a university course on web design, worked at a content management company, and most recently was the design lead at Nutshell, a customer relationship management company. Tyler also organizes the Enterprise Search London meetup. He has written articles for online publications such as A List Apart, Boxes & Arrows, UX Magazine, Johnny Holland, UX Matters, and Smashing Magazine, and has created two CSS frameworks-the 1KB CSS Grid and the Semantic Grid System-which have been downloaded hundreds of thousands of times. He is @TylerTate on Twitter and blogs at TylerTate.com. Tyler is an American currently living in Cambridgeshire, England with his wife, Ruth, and two boys, Galileo and Atticus.